Think you can't grow anything? Think you need special soil or even expensive materials to get something to grow? Think again! We've come up with a fun and interesting way to kick start some plants right in your own yard by simply dropping a bomb! A Seed Bomb that is! Throw, drop, or place your seed balls anywhere you want to grow some beautifully blooming perennial plants. No crushing or stomping is necessary. Just water them or wait for a rainy day. 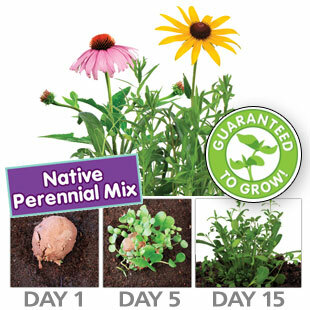 Your seed balls will sprout with vigor and you will have a wildflower garden within weeks! The specially developed clay and peat used in making them traps moisture for the seeds when they need it most and protects the seeds from birds, animals, and other predators.